Tax season is officially over- unless you’ve extended your deadline. I actually have this intense fear of talking about my tax organization system, because I’m terrified it will trigger some sort of IRS spy software and they’ll come audit me. I’m too broke for that (I drive a 13 year old car that’s had a check-engine light on for 8 months, creepy government agent guys, so really think if you’re going to get anything worthwhile from me)! On the other hand, I thought maybe my insanely disorganized organization system may be beneficial to others out there who thrive in chaos like me, and I DO like to be helpful. So I’m sharing 5 tax organization tips for the insanely disorganized in an attempt to help you get ready for NEXT year’s taxes! Ready? First, let me say that I’m not an accountant. I’m not a bookkeeper, an administrative assistant or even a former secretary. I have zero office experience. I am a writer. That’s about it. So I’m not offering advice on how to do your taxes. Okay? 1. Keep it simple. I’ve seen (and downloaded) some incredibly detailed & gorgeous tax organization and budgeting templates out there. I love looking at them. I love using them…for about a day. The problem is, they’re just too darn awesome. Sounds crazy, but for me, the best way to track my money is with two simple sheets in one little excel book. Sheet 1: Three lines columns. Column A shows post title. Column B shows the amount I received from it. Column C: who I got it from. Sheet 2: Expenses. I have columns for my hosting fees, my professional memberships, the different tools that I pay for, etc. While this sheet has more columns, it’s still insanely dull looking and simple. I don’t get distracted by all the prettiness of it. 2. Use a pretty box. While my spreadsheets are boring and simple, the box that I keep all my receipts and check stubs (for the few places that still use checks) is actually very pretty. It stands out and reminds me to use it. It’s also easier to find in the clutter of my office space. 3. Actually USE the pretty box. Yes, this is a separate tip because if you’re anything like me, you will go out and buy the most beautiful box on the planet. Then it will sit there empty for about six months. So to get organized for next year’s taxes, you MUST actually USE the pretty box. Now. Today. Right away. Go ahead, take the lid off, inhale the scent of fresh boxy goodness and put your first receipt inside. So exciting, right? Not really, but it’s taxes, it’s not meant to be exciting. 4. Create a schedule that works for you. Sure, it makes sense to log your payments, expenses, etc the moment they occur, but really, are you going to actually do that? Telling yourself that you’ll spend X amount of time every day doing your book keeping is just going to stress you out when you forget to do it. Once a month, I go through everything and update my simple spreadsheets. If I’m feeling extra industrious, I’ll do it more often one month. Create a tax organization schedule that makes sense for YOUR personality. That’s the only way you’ll stick to it. If you set goals based on other people’s personalities, your psyche will rebel against them. 5. Admit when you need help. If you can afford an accountant, hire one. If not, enlist a family member or friend to help you out. Maybe you have a teenager who rocks at math or a husband who wants to help you out. If you’re not comfortable handing over all the accounting, let someone organize your receipts for you. I do everything on my own right now, but the minute I can afford it, I’m totally outsourcing the accounting! Hey, I can admit my weaknesses. I don’t like numbers. They bore the pants off of me. I like the money, don’t get me wrong. But numbers? Ugh. 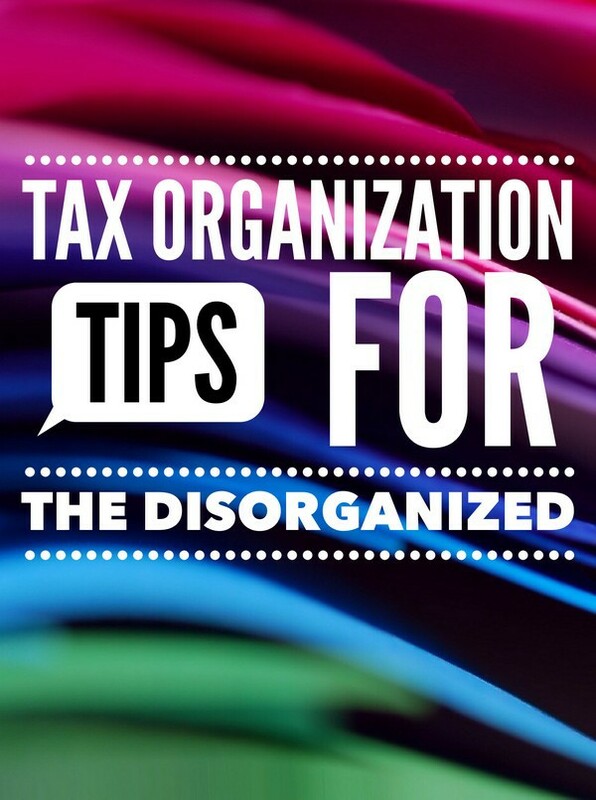 So there you go, my tax organization tips for the totally disorganized. It works for me. I had my taxes done by the middle of February. I would have been ready to roll on January 1st, but I had to wait for my 1099s, updated tax laws and what not. So while I may SEEM like a total scatter brain when it comes to staying organized, my system works pretty well. For more helpful tax related posts, check out a few of my favorite bloggers. How do you keep your taxes organized? Tell me in the comments! Creating a schedule is really important. I did that this year and it’s making things much easier.